Aug - 08 | By: Katherine Wilson | one comment. Searching for Adventure and "the body". 25 years ago, on August 8th, a film shot in Oregon was released nationwide in the theatres. It hasn’t stopped playing since. It is currently #175 on IMDB’s top 250 list, above “Avatar” and “Gandhi”. It was nominated for an Academy Award for Best Adapted Screenplay from Stephen Kings’ novella “The Body”; the Japanese Academy Award for Best Foreign Language Film; and won the Jackie Coogan Youth Award for the cast of River Phoenix, Wil Wheaton, Jerry O’Connell and Corey Feldman. It has a cult following, still bringing visitors from all over the world to the Oregon locations, as well as to celebrations of the film, in Brownsville, Oregon. Five years ago we had a reunion of sorts of the cast and crew who worked on it there, along with the World Famous Pie Eating contest, a cruise-in and sock hop. Alamo Draft House helped put the film on “drive-in-movie style.” None of this would have happened without the indefatigable efforts of Linda McCormick from the Brownsville Chamber of Commerce. Of course, back in 1985, we had no idea this film would become what it has. I first heard about it that Spring, when I got the call from Oregon Film Commissioner Laura Pryor asking me to please drive to Cottage Grove and photograph the “Blue Goose” Train. Later I had to beg to be the Location Casting Director… even after casting “Animal House.” Turned out the UPM didn’t think there was any bonafide crew or any talent in Oregon, so I bet him the cost of putting up and flying actors up from L.A. that I could find director Rob Reiner great talent for the available speaking roles. I won, 12 times, including Andy Lindberg, the kid the Casting Directors in LA could not find for the role of “Lardass”. I also brought them the infamous Irby J. Smith for the 1st AD, who lived in Pleasant Hill, and who “adopted” River Phoenix’s family. The story goes the Phoenix family once worked in Madras, Oregon, and River was born there. Irby also started his son Jay Smith’s career on “Stand By Me,” who, along with my friend Korey Scott Pollard, are still working in the film business in LA to this day. The Producer, Director and Writer/ Producers were so wonderful to work with, I swear it showed up on the screen. They even attended a wrap party for an early MOPAN event: “the Great Lane County Shoot-Out”, when we had about 100 people film every location in Lane County for the Oregon Film Office in one day. Rob Reiner also spent a lot of time listening to the Blues Bands around Eugene. We took over the Eugene Hilton for our offices, restaurants and lodging. The child stars lived there and were fun to be around, even Corey Feldman, who was also “adapted” by my good friend and actress Kathy Neal… kind of his “on location” Mom. The extras, too, were so much fun… a tent full of people having a “Barf-O-Rama. They used Nancy’s Yogurt with blueberries. And all of our friends got work. We had a lot of Kesey’s gang on the set, including Gretchen Fetchin’, Ken Babbs and their son O.B. Babbs, who also got a speaking part. By the time the production left, Rob Reiner, Andrew Sheinman and Ray Gideon were in love with the locations, the towns, and the people of Oregon. 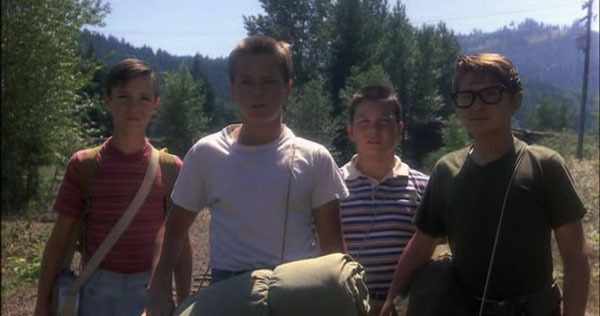 And with each new generation, the world is still in love with the film “Stand By Me’. Just another seminal film from Oregon’s inimitable film history. Me being a true Oregonian native – I am so glad to see that the local industry is being supported, especially Nancy’s Yogurt out of Eugene that was used for the barfing! Nicely done!